A fire b roke out at the Plaintiff’s restaurant, causing extensive structural damage to the restaurant, including destruction of the roof. 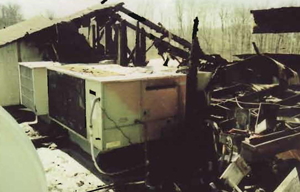 The Defendant’s HVAC repair company was sued with the Plaintiff averring that it improperly installed and/or failed to warn of a dangerous condition which caused the fire. Specifically, the HVAC unit was installed without appropriate insulation and too close to the wall of the restaurant. The defense successfully argued that the Plaintiff had insufficient evidence to prove these allegations. Furthermore, since this Defendant did not install this particular HVAC unit and did not repair the unit at its junction with the restaurant wall, it could not legally be held responsible for this accident. A Non-Suit was entered after three days of trial.